Background: Evidence supports community health worker (CHW) capacity to improve maternal and newborn health in less-resourced countries. However, scaling up and operating effective CHW systems is complex. Best practices for CHW program scale up could be better identified and understood through applying evaluative frameworks for system functionality. Methodology: Between 2012-2014 Healthy Child Uganda (HCU), a Canadian-Ugandan university partnership, collaborated with Bushenyi Health District in Uganda to roll out a comprehensive, district-wide, maternal, newborn, and child health-strengthening initiative including training of ~1500 volunteer, health promotion-focused CHWs. During the post-intervention, qualitative assessment, CHW units were ranked (high, medium, low performing) by project staff. Focus groups were selected via stratified, random sampling of CHW units and random sampling of individuals within units. Semi-structured focus groups sought CHW experiences and perspectives on 7 pre-identified system components identified by other research and HCU experience. Responses were transcribed and translated before conducting content analysis. Ratings were assigned to each system component for each group based on CHW responses. Results: Eight focus groups represented CHWs from 4 high/medium and 4 low performance teams. Of the 7 system components analyzed, lowest ratings across CHW units related to ‘supervision’, ‘linkage to health centre’, and ‘peer support’. ‘Supervision’ and ‘linkage to health centre’ ranking correlated most closely with differences in CHW unit performance. Issues identified by CHWs included absentee supervisors, referral system challenges, and lack of engagement/respect by health workers. CHWs associated supportive supervision with confidence in skills, CHW cohesion, effective referral systems, and community credibility. Conclusions: This study demonstrates use of a systems framework for analyzing CHW system performance. Analysis from this intervention assessment highlights ‘supportive supervision’ and ‘linkage to health centre’ as performance-related. Planners should carefully consider supervision structure, facility orientation and related training to overcome common system challenges. Background: A number of influential trials over the past two decades have generated evidence on where, why and how to deliver care for pregnant women and newborns in low-resource settings, especially at community level. This research posited that substantial reductions in neonatal mortality could be achieved through use of low-technology, community-based interventions, and an integrated package throughout pregnancy and the postnatal period. Methodology: A systematic review was conducted to identify trials of community-based pregnancy and postnatal care. The intervention package, outcomes, and underlying context were assessed to understand the differences and similarities in each setting, particularly related to the characteristics of the community health worker/change agent, the time allotted for the intervention to ‘take root,’ and the key role-players. Where available, the cost of the package was also extracted and compared. Results: Over 30 randomised control trials and quasi-experimental studies in 20 countries were included. They employed a mix of participatory action groups, preventive home visits, and in certain settings, case management of newborn illness at home. While some had positive and influential results, others showed less or no effect on neonatal mortality, even when combined with efforts to improve facility-community linkages and continuity of care. Importantly, there were large differences in the training and scope of the workers liaising with families. ‘Softer’ benefits such as reduced direct costs for families, lessened travel time, and equitable service delivery have not been afforded the same weight and in many cases, not documented. Conclusion: Intervention packages must be adapted for the local context but varying results demonstrate that the adaptation process may not always be sufficient to achieve desired outcomes. This review provides critical information on the specific conditions that need to be met for successful development and delivery of community-based newborn care within the overall health system and socio-political context. Postpartum Hemorrhage (PPH) is a major cause of the nearly 300,000 maternal deaths that occur annually. 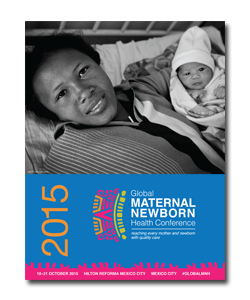 Nearly 34% of maternal deaths in Africa are due to PPH (WHO 2012). South Sudan has the highest maternal mortality ratio in the world; 2,054 per 100,000 live births, along with a high rate of home deliveries and limited access to health care facilities (MOH RSS 2011). With the support of USAID through JHPIEGO, World Vision South Sudan has rolled out prevention of PPH and community distribution of misoprostol using community health volunteers (CHV) WV South Sudan aimed to prevent deaths due to PPH in an area of extremely high need by training CHVs to counsel pregnant women, families and other community members about the importance of taking misoprostol tablets for prevention of PPH and what actions to take in case of PPH incidence. 72 CHVs from Bazungua payam were selected by their community leaders to receive training on PPH prevention between July and October 2014. The training had three days of classroom interactive sessions, lecture, role-plays and group work. The fourth day was community-based practice of counseling of pregnant women and their families using PPH prevention, birth preparedness and complication readiness flipcards. In 9 months of implementation, 1270 pregnant women received counseling on PPH prevention and use of misoprostol. 702 women received misoprostol through HHPs. 184 women delivered at health facilities assisted by skilled birth attendants and received oxytocin immediately after delivery, 508 women delivered at home and took misoprostol within 3 minutes of delivery. There have been no reported cases of PPH in the communities where the program is operating. This project demonstrates that CHVs can effectively distribute misoprostol to prevent PPH in a setting of extremely high need and very low access to health facilities. Background: The Series consists of four articles that together provide the evidence base for the Quality Maternal and Newborn Care that women and their families need, the impact of midwifery care on the survival, health and wellbeing of mothers and newborns, the health system conditions needed to effectively strengthen the reach and impact of MNH services through midwives and the pragmatic steps countries can take to make quality midwifery care available to all. Methodology: The Series was developed by 35 authors from across the globe, including midwives, nurses, doctors, anthropologists, statisticians, researchers, epidemiologists and public health and policy experts. 13 meta-syntheses of women’s views and experiences were reviewed, together with 461 Cochrane reviews of practices, and 7 systematic workforce reviews. Case studies were developed to highlight the consequences of economic development, escalating interventions and inequalities in quality care provision. Results: The Series developed a Framework for Quality Maternal and Newborn Care (QMNC) that can be used and tested in many contexts, it shows that an small increase in the number of midwives by 10% can already reduce maternal and newborn mortality and stillbirths by 27%. The health systems paper provides insight into the success of care by midwives when supported by a network of facilities, an integrated team and a supportive policy environment and the Global Policy paper highlights the impact of midwifery and midwives on the global SRMNH agenda. Conclusion: Midwifery provides a particular contribution through preventive and supportive care that provide positive outcomes for both women and infants, is associated with more positive outcomes and cost-savings when provided by midwives and is substantially under-used and under-researched. A system level shift is needed from fragmented maternal and newborn care focussed on pathologies to a system of quality midwifery care for all. As Indonesia strives to meet its Millennium Development Goal of reducing maternal mortality by 75 percent by 2015, the maternal mortality rate increased in 2012 to 359 per 100,000 live births. UNFPA has categorized Indonesia as one of the ten most dangerous countries for pregnant women. Childbirth without professional health assistance is one driver of high maternal mortality. Aceh Singkil, a district in Aceh province, is one place where maternal death remains common. Its 110,000 residents are served by 11 basic health clinics; 38.28% of deliveries were handled by TBAs in 2010. Discussions on unskilled deliveries and maternal mortality were held in Aceh Singkil, and TBA-midwife partnerships were offered as a potential solution. The idea was supported by village heads, religious leaders, health volunteers, and TBAs and midwives themselves. The district health office then issued an instruction for developing TBA-midwife partnerships, providing formal support for the initiative. Decrees were issued by village heads, legislating that TBAs would receive honoraria to assist midwives with deliveries. TBAs would also receive compensation from the national insurance scheme. MoUs were developed between TBAs and midwives in 31 villages, representing an official agreement between partners, and including information on roles and responsibilities of TBAs and midwives, and compensation due to TBAs. MoUs were signed during public events. Partnerships between TBAs and midwives have led to a decrease in births assisted by TBAs. TBAs are now involved in births at local health clinics, providing spiritual support to mothers. Mothers report feeling more at ease now that they can be assisted by both TBAs and midwives. No maternal deaths have occurred during births assisted by TBA-midwife partners. TBA-midwife partnerships have a positive impact on reducing maternal mortality when they are participatory, are based on strong incentive systems, and permit the involvement of TBAs in facility-based births. Background: Despite many efforts to rebuild Afghanistan’s health workforce, recent evidence highlights that gaps remain in availability, distribution and capacity of clinicians needed to provide lifesaving maternal and newborn health (MNH) services. To address this, the Afghan Midwives Association (AMA) developed an innovative mentorship program to ensure continued practice opportunities after graduation to aid skill retention in midwives working in remote facilities. Methods: AMA’s mentorship model trains experienced midwives to mentor recent graduates posted at periphery health facilities and supports them to conduct: 1. Needs assessment of mentee skills. 2. Routine visits (at least six per year) for onsite coaching. 3. Assessment of mentee skill retention using national quality performance standards for antenatal care (ANC), normal and complicated labor and delivery, and postnatal care (PNC). 4. Assessment of facility infrastructure, supplies, equipment and management support for MNH services. Results: The program was piloted in 28 health facilities in six provinces in 2011. During the first year of implementation, participating facilities improved performance in ANC performance from 20% to 88%, labor/delivery performance from 19% to 85%, complicated labor/delivery performance from 15% to 94% and PNC performance from 16% to 94%. Average scores for MNH service support increased from 38% to 81% over the same period. In the second and third years of implementation, additional facilities were included, with average scores improving from similarly low levels to more than 70%. Conclusion: To date, the program has successfully supported more than 80 midwives to mentor nearly 200 colleagues, resulting in improvements in staff competency and working environments in nine provinces of Afghanistan. The program is ongoing with 27 experienced volunteers mentoring approximately 70 less experienced peers at 30 facilities in three provinces, and plans are underway to expand the program to at least 20 additional facilities in 2015. Preeclampsia/eclampsia (PE/E) causes around 40% of maternal deaths in some Nigerian states. Although magnesium sulphate (MgSO4) has been available in Nigeria during the last ten years, bottlenecks continue to limit the uptake of MgSO4, including inadequate knowledge across the both the health system and community levels and fragmented efforts by different institutions. A mixed methods approach as part of a landscaping analysis toward understanding who, what, why, how and where the bottlenecks are to improving access to MgSO4 supply at health facilities; ranging from policy development and dissemination, commodity procurement and distribution; health provider knowledge and skills, community knowledge and health seeking behavior. Bottlenecks are being reduced by combined efforts of the FMoH, local and international NGOs, training institutions and regulatory bodies. Following successful introduction of MgSO4 at tertiary level, primary health care providers were trained to provide the loading dose to women presenting with PE/E and referred onwards – driving both the public and private demand for the commodity. This influenced policy change at federal and state level and listing of MgSO4 on state essential medicine lists. Schools of nursing and midwifery were engaged to incorporate MgSO4 on their pre-service curricula. Engaging an international manufacturer (e.g. FIDSON) through a volume guarantee arrangement has also resulted in increasing the commodity supply in some northern states as well as involvement of the National Agency for Food, and Drugs Administration and Control (NAFDAC). Supply and distribution of MgSO4 for treating PE/E has increased over the last 5-10 years in Nigeria. This is a result of involvement of multiple actors and agencies from the regulatory body, procurement, logistics and distribution, quality assurance, to the ministry of health. However, challenges remain especially in ensuring that good quality magnesium sulfate is available at all points of services where women seek PE/E care. LMICs experience complex challenges around the uptake and implementation of evidence-based clinical practice guidelines. In the context of the UN Commission on Life Saving Commodities, we aimed to reduce maternal and infant morbidity and mortality in LMICs by encouraging stakeholders to appropriately implement clinical practice guidelines and optimize the use of oxytocin, misoprostol and magnesium sulfate at the bedside. Through the use of a unique knowledge translation (KT) approach that includes exploration of country-specific priorities, barriers, and facilitators, we partnered with four LMICs (Uganda, Tanzania, Ethiopia and Myanmar) to develop a tailored and ready-to-use implementation strategy to enhance guideline uptake locally. A multiphase approach was used. . In consultation with country partners, relevant local stakeholders (e.g. health care providers, administrators, researchers/academics, policymakers) were identified and engaged. WHO guidelines were selected based on local priorities for improving use of oxytocin, misoprostol and/or magnesium sulfate. To identify priorities, barriers, facilitators and options for guideline implementation, we conducted online surveys, and held country workshops using focus group discussions, a group nominal technique and RAND appropriateness methods with local stakeholders. Contextualized implementation strategies were developed and are being implemented. Ongoing resources and coaching support are also being provided. Our unique KT approach aimed to address current challenges associated with use of maternal health commodities in LMICs. LMIC stakeholders were supported in identifying and assessing the contextual factors that affect guideline use, as well as in developing a tailored implementation action plan. There were significant similarities in challenges to guideline implementation across the four countries that can aid other countries in their efforts. We have developed a range of implementation resources and tools (www.greatnetworkglobal.org) for LMICs to use and adapt, in order to implement guidelines at local level in an evidence-based way. Three low-cost, effective maternal health medicines – oxytocin, misoprostol, and magnesium sulfate – can save many women who die each year of postpartum hemorrhage (PPH) and pre-eclampsia and eclampsia (PE/E). Supportive policies, appropriately funded and effectively implemented, are essential for ensuring access to these medicines in health facilities and at the community level. A favorable policy environment includes: maternal health medicines on national essential medicine lists (EMLs); evidence-based national standard treatment guidelines (STGs) guiding clinical practice; and adequate budgetary support to ensure policies are fully and effectively implemented. 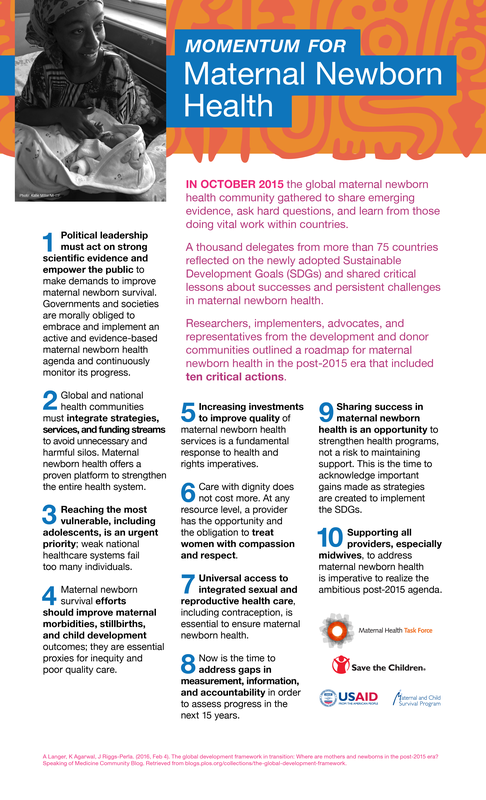 In many countries, a supportive policy framework is not in place, or not well-harmonized; for example: essential maternal health medicines may not be included in national EMLs or other key policy documents; and national clinical guidelines, training curricula, and service delivery policies may not reflect the latest evidence-base. In Burkina Faso, a group of stakeholders worked together to add misoprostol on the national EML, and to update the STGs to standardize them in accordance with the 2013 WHO and FIGO guidelines. The committee engaged with national authorities to review the available evidence, and gained their support. In February 2014, the Ministry of Health published the 2014 revision of the national EML which includes misoprostol for prevention and treatment of PPH at all levels of the health system. The updated clinical guidelines will be finalized in 2015. The policy environment for enabling access to and use of essential maternal health medicines is complex and variable. While there is no single strategy for establishing a supportive policy environment across countries, learning from experiences in different contexts can inform effective action. The experience in Burkina Faso offers a potential model for effective, focused advocacy in countries where misoprostol’s lifesaving benefits are not yet available. Increasing Access to Life-saving Commodities for Women and Newborns: Getting the Numbers Right! The success of key interventions for maternal and newborn health depends upon the continuous availability of essential medicines and supplies at health facilities. Reproductive, maternal, newborn, and child health (RMNCH) experts agree that the paucity of data necessary to estimate program needs for these health products is a major factor contributing to the lack of commodity availability. To achieve maternal and newborn health goals, the UN Commission recommended improving the supply of essential RMNCH commodities. The technical experts implementing this recommendation developed a guidance tool to improve the quantification capacity of national program managers for the 13 UN Commission life-saving products, including three maternal health medicines and four newborn commodities. The guidance information package consists of (1) an overview on forecasting and supply planning, (2) forecasting algorithms for each of the 13 commodities describing special considerations to take into account, and (3) recommended tools to facilitate quantification of these commodities. Additional technical experts were consulted on developing the forecasting algorithms. The guidance was validated in five countries: Nigeria, Tanzania, India, Bangladesh, and the Democratic Republic of Congo (DRC). In all cases, the guidance helped program managers to generate more evidence-based forecasts and supply plans. In the DRC in 2012, only 537,912 ampoules of oxytocin were procured for distribution nationally. Using the quantification guidance in 2014, the need for 2,987,218 ampoules was highlighted. The guidance allows country programs to gain a better understanding of the quantities of essential products needed nationally—a crucial piece of information to support advocacy and to enable forecasting and supply planning to promote continuous availability of the 13 essential commodities. Evidence-based quantification improves access to the life-saving commodities that women and their babies need to reduce morbidity and mortality.